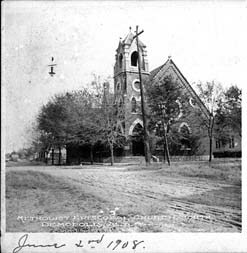 Methodist Episcopal Church, Demopolis. January 2nd, 1908. Source: Postcard collection of John Reynolds. More historic postcards here. How Can I Find My Family? Photos posted for identification, Maybe you can help others with these mystery faces. Are some of these folks depicted your ancestors? "In the Heart of Alabama's Black Belt Region"
Abner Lipscombe, and was given as a compliment to the first white settlers, expatriated French citizens and commemorative of Napoleon's great victory at Marengo over the Austrian armies on 1800 June 14. JONES - SPINKS. Bob Jones documents his Jones ancestry on the Diggin up Bones web page. A great site with extensive resources for Jones researchers in Marengo, surrounding counties and elsewhere. WILLIAMS. J. B. Williams Skinner, Winnie Gee Williams Loranz, and Grace Bailey Mellard conducted extensive research on the Williams line in the 1960's. They spent years following up leads and interviewing old folks around Marengo County. The resulting document, dubbed The Skinner Papers, chronicles the girls' lives growing up in the extended Williams family at Williams Hill --located about half way between Gay's Landing on the Tombigbee and Nanafalia-- the home of their father Jacob B. Williams. Other families mentioned in detail are: Barron, Bailey, Caller, Hasty, Matthew, McGrew, Nichols, Russell, Schuyler and Terrell. Bob Jones has placed a few pages of The Skinner Papers online to whet the appetites of Williams and Marengo County researchers. This link will assist you to locate a center near you to do your own research. See how boundaries have changed over the years. Dept. of transportation Maps available for viewing.